Trailer for Bye Bye Man, starring Carrie-Anne Moss, Faye Dunaway and Douglas Smith. People commit unthinkable acts every day. Time and again, we grapple to understand what drives a person to do such terrible things. But what if all of the questions we're asking are wrong? What if the source of all evil is not a matter of what...but who? From the producer of The Strangers and Oculus comes The Bye Bye Man, a chilling horror-thriller that exposes the evil behind the most unspeakable acts committed by man. When three college friends stumble upon the horrific origins of the Bye Bye Man, they discover that there is only one way to avoid his curse: don't think it, don't say it. But once the Bye Bye Man gets inside your head, he takes control. Is there a way to survive his possession? Bye Bye Man is based on author Robert Damon Schneck's short story The Bridge to Body Island. The film's production was a quick one, having wrapped filming in just over a month on December 11, 2015. The film completed production so quickly that it's original theatrical release was pushed up from October 14, 2016, to June 3rd. A bold move, considering it forces Bye Bye Man to take on the bigger summer blockbusters. Doug Jones' body type allows the actor to easily become er, creepy with the help of some make up. 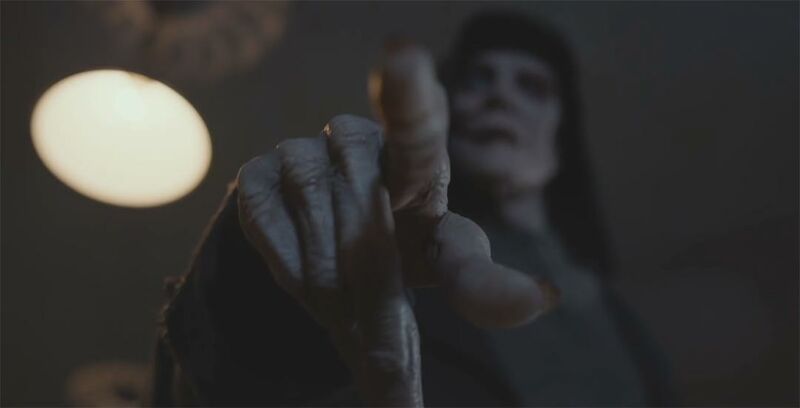 The rule holds true in the Bye Bye Man trailer; as shown in the screencap above. The film is supposedly based on true events, though I'm having a tough time figuring out what exact incident the story is based on. But I digress. Bye Bye Man looks like your typical horror, mixing elements of Final Destination and Candyman. While the trailer opens with promises of jumps and scares, it concludes by reminding audiences there are sure to be some gratuitous moments as well. Not exactly my cup of tea, but should find an audience amongst horror-philes.